286 pages | 3 B/W Illus. Climate change will present a series of challenges to engineers concerned with the provision of both building internal appliance drainage networks and rainwater systems within the building boundary, generally identified as the connection to the sewer network. Climate change is now recognised as presenting both water shortage and enhanced rainfall design scenarios. In response to predictions about immanent climate change Transient Free Surface Flows in Building Drainage Systems addresses problems such as the reduction in water available to remove waste from buildings, and conversely, the increase in frequency of tropical-type torrential rain. 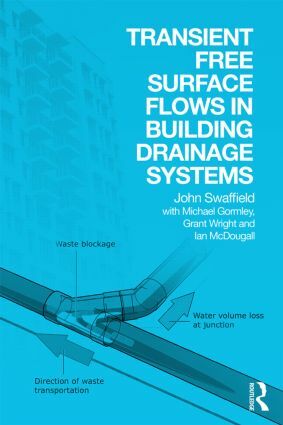 Starting with introductory chapters that explain the theories and principles of solid transport, free surface flows within drainage networks, and attenuating appliance discharge flows, this book allows readers from a variety of backgrounds to fully engage with this crucial subject matter. Later chapters apply these theories to the design of sanitary and rainwater systems. Case studies highlight the applicability of the method in assessing the appropriateness of design approaches. In this unique book, research in modelling for free surface flows at Edinburgh’s Heriot-Watt University is drawn on to provide a highly authoritative, physics-based study of this complex engineering issue. John Swaffield was President of the Chartered Institution of Building Services Engineers for 2008–09, and Emeritus Professor of Building Engineering at Heriot Watt University, Edinburgh, until he tragically passed away in early 2011. The writing of this book was completed by his colleagues at Heriot Watt. Michael Gormley is a Senior Lecturer in Architectural Engineering in the School of the Built Environment at Heriot-Watt University. He has been an active researcher in the field of fluid flow modelling since 2000. His research interests include pressure transient propagation and suppression in high rise buildings, water conservation and the modelling and control of infection spread in hospitals. Grant Wright is a lecturer in Civil Engineering in the School of the Built Environment at Heriot-Watt University. His research interests include fluid flow modelling at multiple scales, ranging from curtilage level drainage systems through to regional scale flood modelling, as well as the performance of Sustainable Urban Drainage Systems and public perception of flooding related issues. Ian McDougall is a computing officer in the School of the Built Environment at Heriot-Watt University. He has been responsible for the production and maintenance of drainage related computer models since 1995. His research specialisms are solid transport in horizontal drains and water conservation.